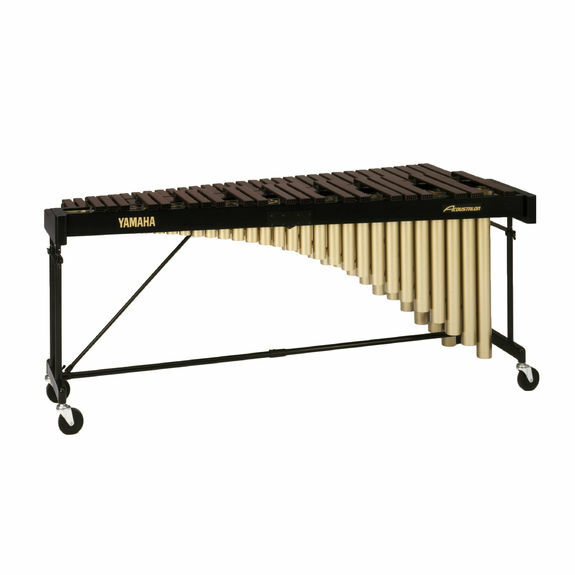 Yamaha 4 1/3 Octave Acoustalon marimba with A25-C76 range, three-position resonator slots, height adjustable frame, dual angle supports and horizontal leg supports. Includes cover. The Acoustalon bars are produced from fiberglass reinforced plastic in a one-step manufacturing process to provide exceptional durability and a pure tone. The scientifically designed Sonic Tones Holes produced in this process give Acoustalon bars a tone similar to rosewood. The graduated tone bars are a professional feature that promotes tone quality, volume and playability. The resonators of the YM-2400 feature a cut-away design to reduce overall weight of the instrument and also feature a 2-tracking system that allows resonator height adjustment for pitch and tone control. The ability to adjust the height of the YM-2400 promotes proper playing technique and comfort. A lower crossbar support helps to ensure the integrity and life of the contemporary styled height adjustable frame. Oversized, 4" casters allow for easy transport. Two casters lock for stability during performance. Bar Size: Graduating from 1 1/2" ~ 2 1/4" x 1"
Resonators: Cut-away design and 3-tracking system. Height Adjustable: Height adjustable from 35" to 38 1/4". Dimensions: 78" x 34 1/4"
The description says "with a tone similar to rosewood." The word similar is used rather loosely. Yes, the acoustalon has a very distinctive tone, but that's not necessarily a good thing. The idea of synthetic fiberglass bars is to increase durability, but maintain quality of sound. The acoustalon is much more durable; you could probably play it with a rock. However, it does not even come close to sounding as good as a rosewood marimba. It does cost somewhere around five thousand dollars less than a rosewood, so it's your choice. Money or tone quality? Excellent marimba all around. 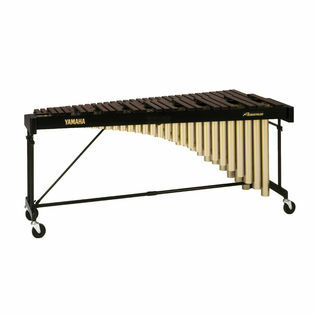 I personally own this marimba and it is great from beginning marimbists to much higher performers. Great sound and extremely compact design for taking apart and moving.